On July 20, 1969, Neil Armstrong and Buzz Aldrin stepped onto on the surface of the moon for the first time. Michael Collins, the third astronaut, stayed behind to pilot the spacecraft. I was just 12 years old as I sat on the floor in front of a black and white television at the house of my friend, Julie. Her parents sat on the sofa behind us watching in awe; we were all mesmerized. Watching this event fueled my keen interest in stories of space travel. I saw 2001: A Space Odyssey the year before—and loved it, though I didn’t really understand much of it. But after the moon walk I saw every movie about “outer space” that I could, both at the theaters and on television. Some of my favorites include, The Day the Earth Stood Still (1951), The Thing from Another World (also 1951), Alien (1979) with Sigourney Weaver, and the great tag line, “In space, no one can hear you scream.” Yikes. By the time I got to college I became interested in the Star Trek series, and later on in its many permutations. Then of course, there was Star Wars: Episode IV: A New Hope, released in 1977, easily my favorite. While these films were different in several ways—some painting aliens as invaders and others as friends (and of course Star Wars was in a class by itself), they all had one thing in common. They portrayed the idea of space travel as something that required not only great bravery but also a willingness to take great risks. On July 20, 2014, it will have been 45 years since the historic moon walk. As we commemorate this achievement of those brave men, we should also celebrate the steps and leaps we take in our pursuit to be writers and authors. My father was a science fiction fan, and I carry on the tradition to this day, even though I dabble in many more genres these days. Science fiction gave us an idea of a brighter future, as opposed to the dystopian, young-angst version of it in today's reading world. I started young, too, with the original Star Trek series and stories by Ray Bradbury. I never thought that as a writer I had an astronaut's courage, but now I do. Thanks! I, too am a Ray Bradbury fan--big time! Was so sad when I heard he died--last year I think. And we DO have to be courageous as writers! 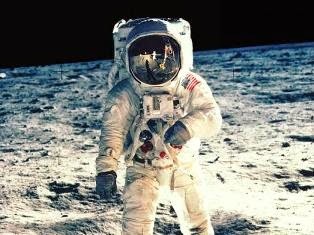 I just watched the Mad Men episode that depicted that first moon landing and you could feel the enormity of the moment. I was all of 2 y.o. so I either missed it or can't remember watching it. How wonderful that you have that memory! !